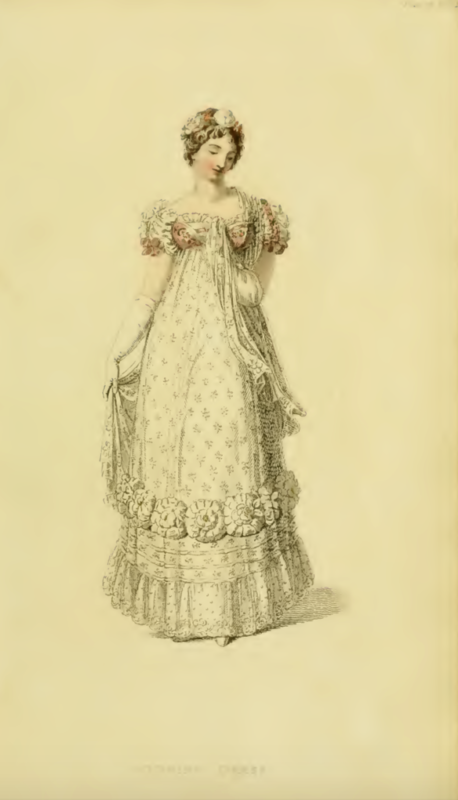 In commemoration of the wedding of HRH Princess Charlotte of Wales to HSH Prince Leopold of Saxe-Coburg-Saalfield in May of 1816, Ackermann’s June 1816 edition features a white “bridal dress” as its first fashion plate, the first time, I believe, such a garment ever appeared in its pages. Historians suggest that the white bridal dress, or wedding gown, did not become de rigeur in Western culture until after Queen Victoria wed in white in 1840; Charlotte’s gown was actually silver. 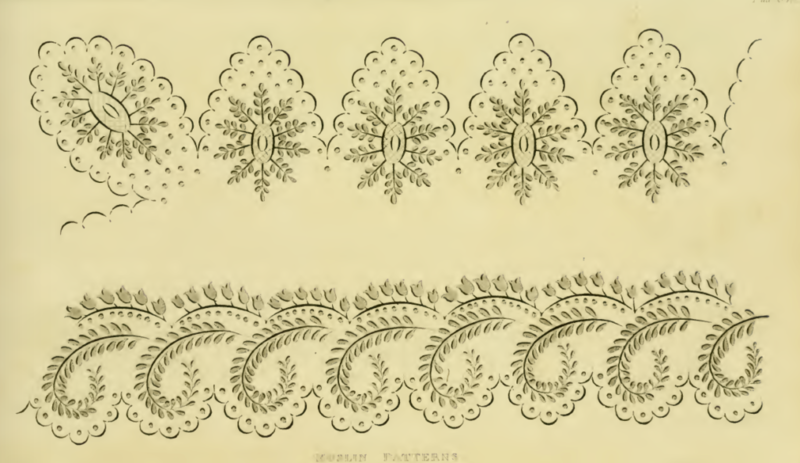 But dressmaker Mrs. Gill of Burlington Gardens anticipated the Victorian trend with this design, which features white striped gauze over a white satin slip. And wearing white was not a symbol of sexual purity, but of class status: only the richest people could afford to pay to launder such easily soiled clothing. 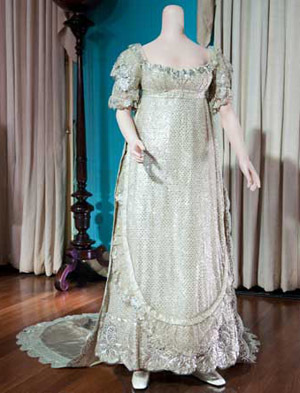 Princess Charlotte’s wedding dress (1816) – This elaborate cloth-of-silver empire line dress embroidered with flowers and trimmed with Brussels lace was worn by Princess Charlotte when married Prince Leopold of Saxe-Coburg in 1816. This remarkable, glittering dress is 195-years-old, the oldest royal wedding dress that Historic Royal Palaces cares for. © The Royal Collection/Historic Royal Palace. Regency wedding gowns were rarely expected to be worn only once and never again, as they typically are today. 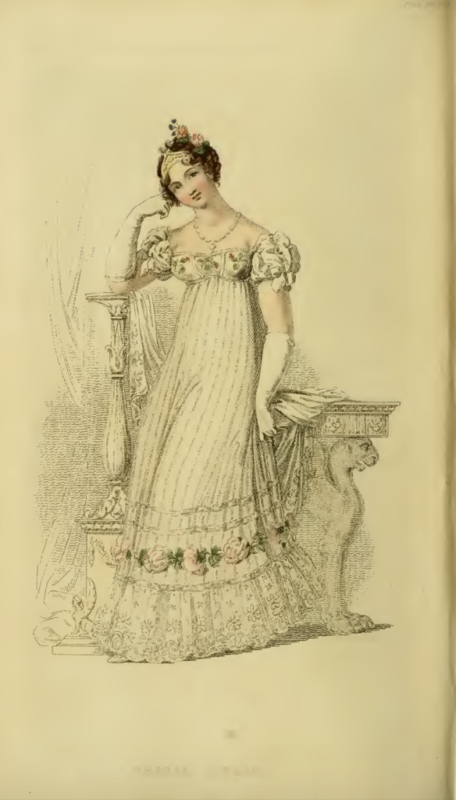 If a Regency-era lady had a gown especially created to be married in, as Mrs. Gill’s customer did, it was more likely to become her new best dress, rather than something to be stored away in her wardrobe. Can you imagine what it might be like to step into this elaborate dress just to attend church of a Sunday? 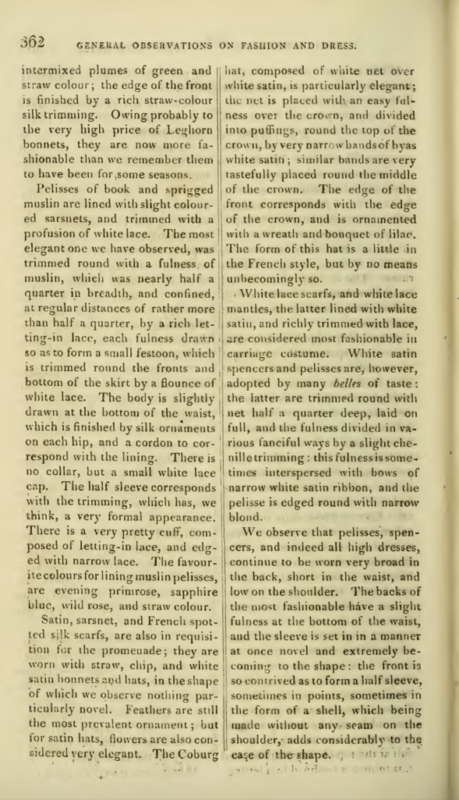 The issue’s second fashion plate is also white: an evening dress made of white lace worn over a white satin slip. This gown’s adornments are even more pronounced than those on the bridal gown. The “wrath of beautiful fancy flowers” “surmounting” the flounce and 3 bias tucks are almost as large as the lady’s head! Of what do you think they were made? 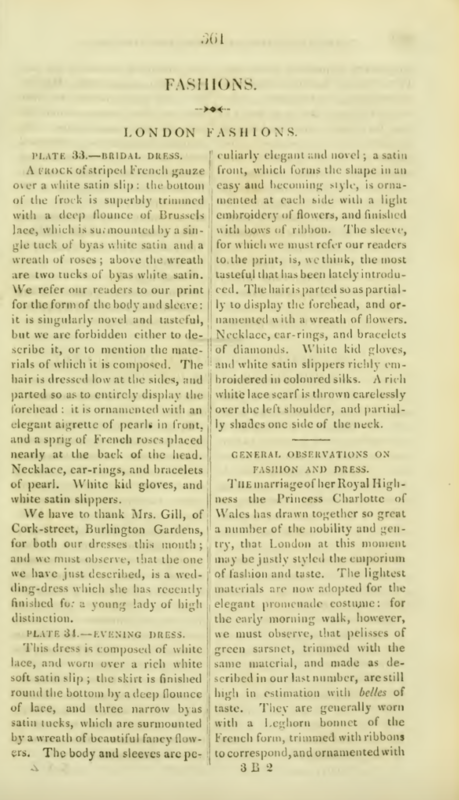 The writer of the London Fashion column reports that she/he is “forbidden either to describe it [the body and sleeves], or to mention the materials of which it is composed”—no doubt, to encourage viewers to visit Mrs. Gill’s shop and enquire themselves. A nice marketing trick, no? 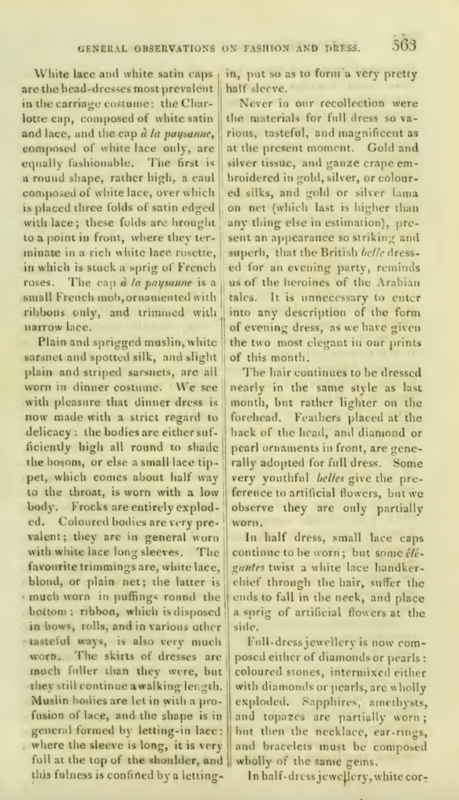 The long description of London fashions include the month’s most fashionable colors: “green of all the lighter shades, evening primrose, sapphire blue, pale blush colour, and straw colour.” Our columnist also notes that “frocks are entirely exploded.” I’m not sure whether this comment refers to the observation made just before it, that bodices have moved higher, or are covered by a small lace tippet; or to the one made just after it: “Coloured bodices are very prevalent: they are in general worn with white long sleeves.” What is more clear is that full dress jewelry composed of colored stones mixed with pearls or diamonds is also “wholly exploded.” Instead, London’s ladies are wearing only diamonds or pearls, or sets of necklaces, earrings, and bracelets all made from a single gemstone (sapphires, amethysts, topazes being the most common), when they step out in full dress. For half-dress, gold, or white cornelian intermixed with gold, is deemed suitably elegant. What would happen, do you think, if a lady arrived at court wearing unfashionable jewels? I do not want the information to be used by anybody for direct marketing purposes.